The Winklevii are going to space, and they're using Bitcoins to do it. Internet entrepreneurs and Olympic athletes Cameron and Tyler Winklevoss, square-jawed twins whose dispute with Facebook founder Mark Zuckerberg was chronicled in the Oscar-winning 2010 film "The Social Network," have bought seats aboard Virgin Galactic's suborbital SpaceShipTwo, NBC News reported Wednesday (March 5). The twins paid their deposit using Bitcoins, the virtual currency in which they have made significant investments. Their purchase pushes the passenger list for SpaceShipTwo over 700, according to NBC News. While undergrads at Harvard in the early 2000s, the Winklevii and fellow student Divya Narendra started a social networking site called HarvardConnection, later renamed ConnectU. In 2004, Cameron and Tyler Winklevoss sued Zuckerberg for $140 million, alleging that he stole their idea to create Facebook. The suit was eventually settled, reportedly for $65 million. Cameron and Tyler Winklevoss were big-time rowers at Harvard and beyond, placing sixth in the men's pair event at the 2008 Summer Olympics in Beijing. A number of other high-profile people — including Brad Pitt, Lady Gaga, Justin Bieber and astrophysicist Stephen Hawking — have bought tickets to ride SpaceShipTwo, which currently cost $250,000. The vehicle is designed to reach suborbital space, giving its passengers a few minutes of weightlessness and a view of Earth against the blackness of space. 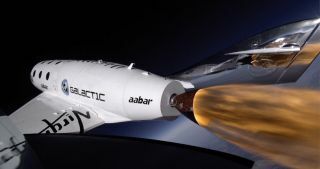 SpaceShipTwo has already made three rocket-powered test flights and could begin commercial operations later this year, company officials have said.